The Jewish holidays are filled with accessories: Rattlers on Purim, spinning tops on Hanukkah, a bow and arrow on Lag B'Omer – each holiday and its toys. Simchat Torah has its own unique accessory – the flag. What began 300 years ago with flags created by professional painters, sometimes symbolizing the flag holder's status, is now made in China with a life span of a disposable cup. 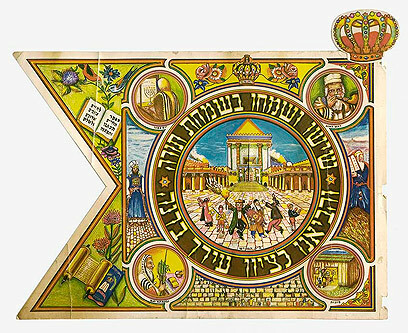 Indeed, the Simchat Torah flag is not as valuable as it used to be, and yet – perhaps more than any other festive item – over the past century the flag has served as a mirror of the dramatic changes Israel's Jewish society has gone through. 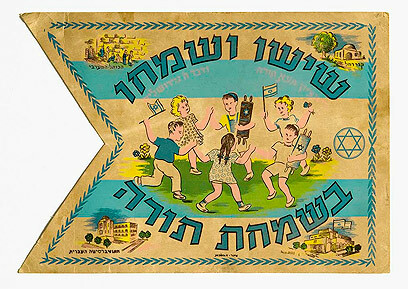 A huge Simchat Torah flag has been waved recently over the Eretz Israel Museum in Tel Aviv, announcing a new exhibition displaying holiday flags which have turned into collector's items over the years, but also the changes the Israeli society has gone through. "Throughout the 300 years in which the flag has been used, it has undergone great changes affected by real events and figures," explains Nitza Baharuzi-Baroz, the exhibit's curator. "As a flag is an item which is not preserved, we only have flags starting from the 19th century. The ancient flags include drawings of children in Eastern European clothes and models of the Holy Ark and figures like Moses and Aaron. When we see these flags alongside the flags created in Israel, starting in the 1940s, the distance made by the flag is emphasized, pointing to its very deep layers. "In the flags created in Israel from the 1940s, the Israeli milieu affects the design, expressing the first generation born in Israel and providing a feeling of new Jewishness, which is disconnected from the Diaspora. "Instead we see bearded adults, children with 'kova tembel' (the national hat). The European clothing is replaced with shorts. After the State's establishment, the traditional dancing with Torah scrolls turns into boys and girls dancing Hora together." "We must remember that for many years, the Simchat Torah flag did not only characterize the religious population. 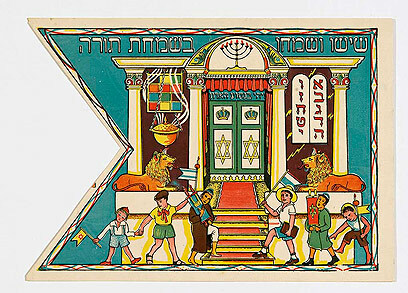 Many seculars would arrive at synagogues in the evening along with their children, who brought along decorated flags. "A review of the flags from then till now shows that despite the changes, the flags always had a traditional foundation." The 1940s. 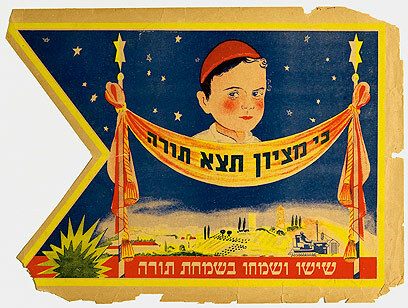 While flags abroad used to include captions like "Rejoice in the Torah", the Israeli flags began using the saying which can be seen here: "For out of Zion shall go forth the law." The transition from the Diaspora to an independent country is also expressed in the tractor plowing the land – an indication of labor and settlement. The 1960s. 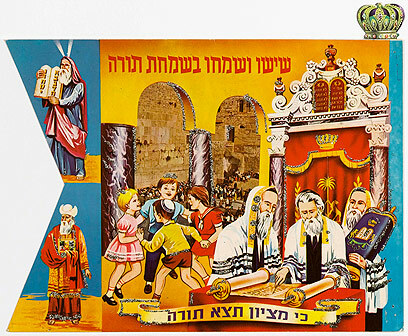 After the Six-Day War and the liberation of the Western Wall, it once again became an important part of the Israeli narrative and its photo can be seen in the background of children dancing around a Torah scroll. The 1960s. 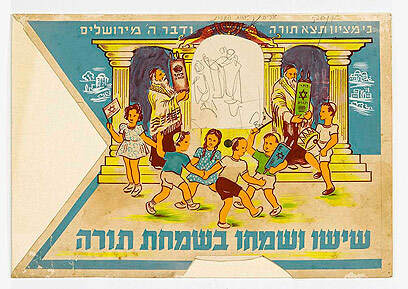 This flag combines several High Holiday customs, including the Torch Dance which was common in some Jewish communities and was also expressed in a candle children would attach to the tip of their flag. The late 1940s. This is a flag from after the State's establishment. The feeling of great pride can be seen in the drawings decorating it: The holy sites can be seen on both sides – the Western Wall Rachel's Tomb, and the old Knesset building and Hebrew University on the other two sides. Secular buildings alongside holy structures. The flag has two stripes reminiscent of the flag of Israel. There are dancing children, but no Holy Ark. The 1950s. Symbols representing the Temple, alongside the symbols of the 12 Tribes, who expressed the return to the Land of Israel and the settlement in the country. The 1970s. This flag was drawn after the mass immigration of the 1950s. 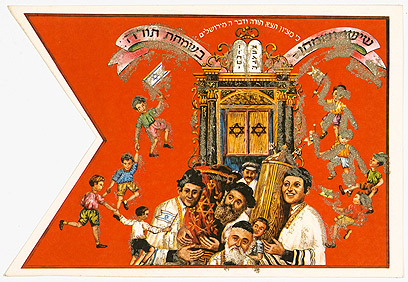 A young man can be seen on one side dancing with a typical Sephardic Torah scroll, while another young man next to him is holding a typical Ashkenazi Torah scroll – presenting the melting pot the Israeli society aspired to reach. The design of children dancing in the background was likely inspired by the stickers children used to collect at the time. The 1950s. 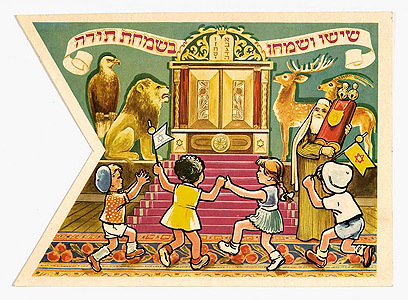 Four animals can be seen on the flag: A tiger, a lion, a deer and an eagle, expressing a famous Pirkei Avot (Ethics of the Fathers) Mishna which focuses on persistence. The early 1950s. An interesting model of the front of a synagogue is drawn on the flag, using reminders from the Temple, like two lions and the High Priest's garment. 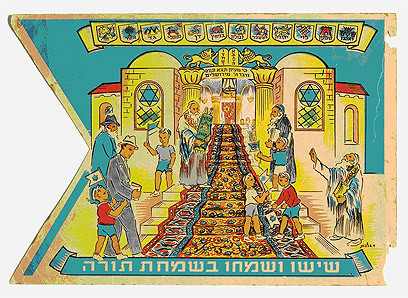 Ashkenazi and Sephardic children can be seen marching at their feet, as a model of the Israeli melting pot. The 1950s. An original, rare drawing by painter David Gilboa. On the flag one can still see the pencil sketch outline. Gilboa drew pillars symbolizing the Temple and two adults with a Torah scroll. Boys and girls are seen dancing next to them. The Israeli spirit is expressed in the flags of Israel waved by the children and in the boys' shorts. See all talkbacks "History lesson with Simchat Torah flag"